This is our preferred way of cooking whiting on the boat for breakfast. It is simple and quick, but the flavour of the whiting comes through beautifully. The whiting must, of course, be very fresh. Be generous with the lemon juice. It caramelises a little in the pan and the whiting are tossed in it after they have cooked. Dredge the whiting in the ground rice. Heat the butter in a large heavy-based frying pan and add the garlic. Add the whiting fillets, in batches, and cook for about 1 – 2 minutes before turning and cooking the other side. The fillets should be almost breaking up. Keep warm whilst remaining fillets are cooked. Remove the fish from the pan and add the lemon juice. 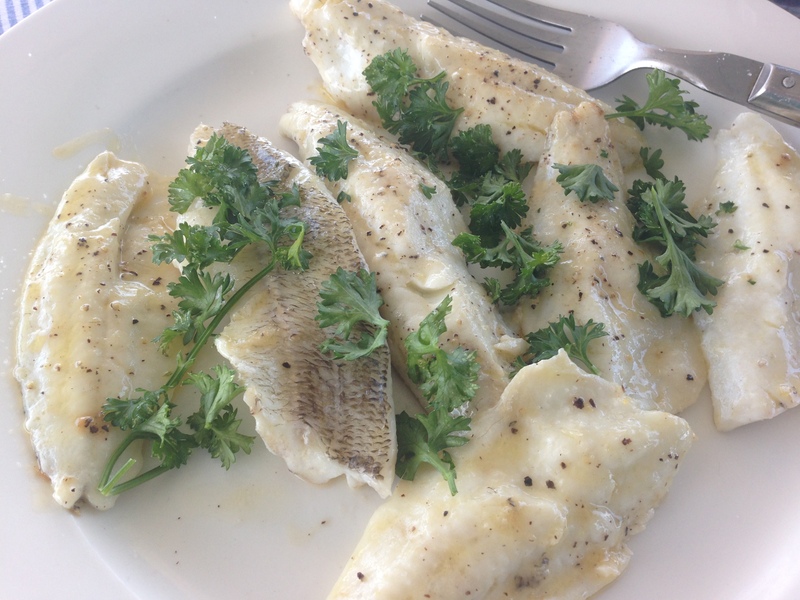 Allow the lemon juice to caramelise a little, then return all the whiting fillets to the pan. Turn them so that all the fillets are coated with lemon.